Kamui Ski Links is one of Hokkaido’s best little ski areas, and is located 30 minutes drive from Asahikawa City and is convenient for day trips from Furano or even Sapporo. Kamui gets over 8m of Central Hokkaido’s perfect powder snow and is blessed with a huge amount of blue sky days. There is a large range of accommodation in Asahikawa City including Asahikawa Grand Hotel, Smile Hotel, Art Hotel, Court Hotel, PremierHotel CABIN and Hotel Crescent. Full rental for skiers and snowboarders is available. Full day full rental is \5000yen for ski and snowboard sets. Half day rental is \4000. Kid’s full day full rental is \3500. dining area serve up delicious and easy food. curries, sandwiches and a variety of drinks. Enjoy Asahikawa’s famous ramen noodles not in downtown Asahikawa but in the ski mountain! It takes 30 minutes by car and 40 minutes by local bus. It takes 70 minutes by car, otherwise catch a train to Asahikawa and then change to the local bus. There are some guide tours available from Furano. It takes 4 hours by car, otherwise catch a train to Sapporo and then change to another train to Asahikawa. Asahikawa International Airport is the nearest airport. It takes 40 minutes from the airport to city, then change to another bus to the slope. There is a large range of accommodation in Asahikawa City including Asahikawa Grand Hotel, Loisir Hotel and Washington Hotel. Asahikawa City is only 20km from Kamui Ski Links. Asahikawa City has the amazing Winter Festival in early February. There are over 1,200 restaurants and bars in downtown Asahikawa where anyone can find something to enjoy. 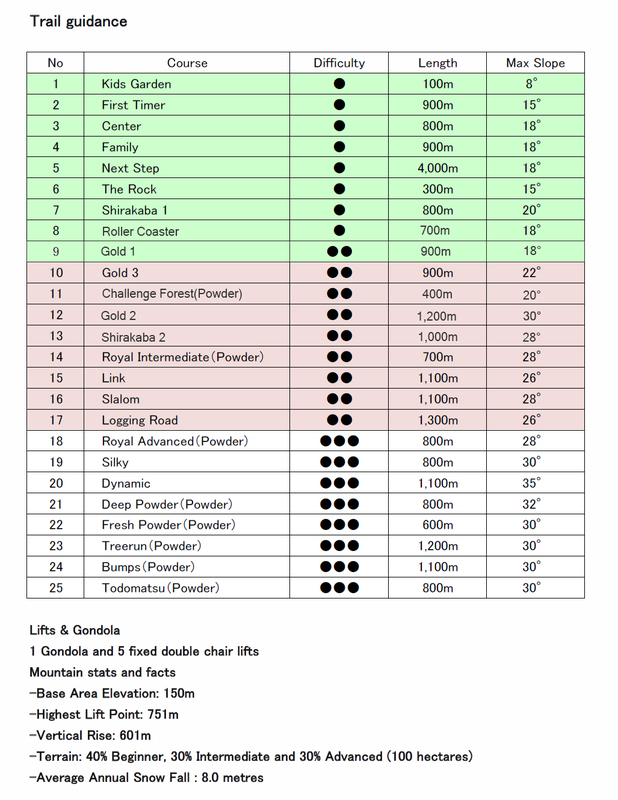 Kamui Ski Links offers you tree ski/snowboarding option within our controlled area. 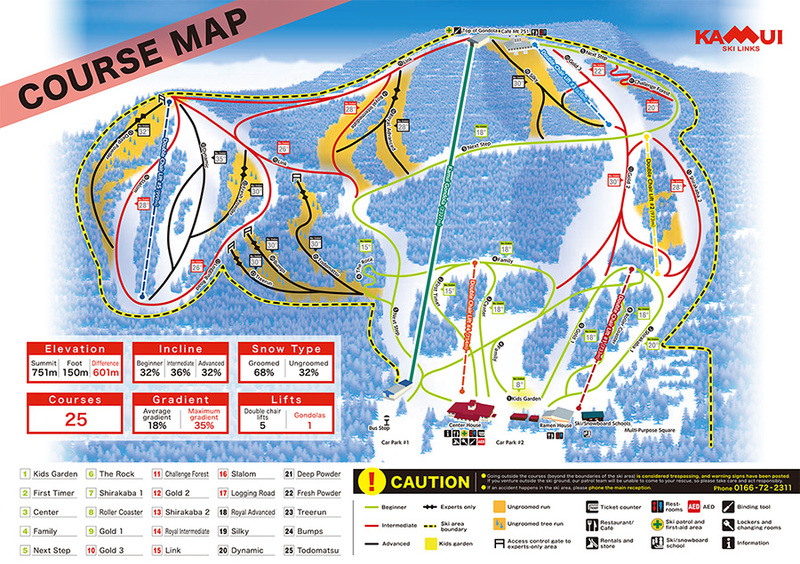 Shinsetsu, Tree Run A, B and C, those 4 runs are ungroomed and open for tree skiing. Please maintain control on all courses and take care with bumps and trees. These courses are subject to closures due to the poor weather/snow conditions. Skiing/snowboarding off piste is prohibited. Kamui Ski Links will not accept responsibility for accidents or injuries off piste. You will subject to pay all costs from any rescue that is performed off piste. responsibility for accidents or injuries out of bounds. You will subject to pay all costs from any rescue that is performed out of bounds. Copyright(c)2015 Kamui Ski Links Co.,Ltd. All Rights Reserved.